Home › ibiza link › Saturday, 7th of December.. Teatro Posillipo (Naples, Italy) presents: Jean Claude Ades! Saturday, 7th of December.. Teatro Posillipo (Naples, Italy) presents: Jean Claude Ades! 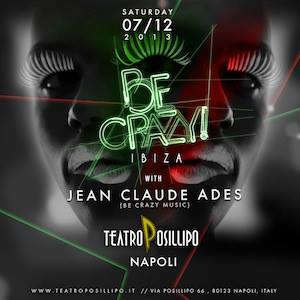 Next Saturday 7th of December, Teatro Posillipo (Naples, Italy) will present a super guest:Jean Claude Ades with his show “Be crazy”. “Be crazy” is one of the most elegant and appreciated shows of Ibiza and Jean Claude Ades is an excellent Dj based in the magical island, and also in summer 2013 was proposed in the amazing location of Ushuaia tower. So, if you are in Naples, don’t miss it! And this is the poster of the event! ‹ Friday, Ipanema Club, Barletta (Italy) presents.. Blackroom!